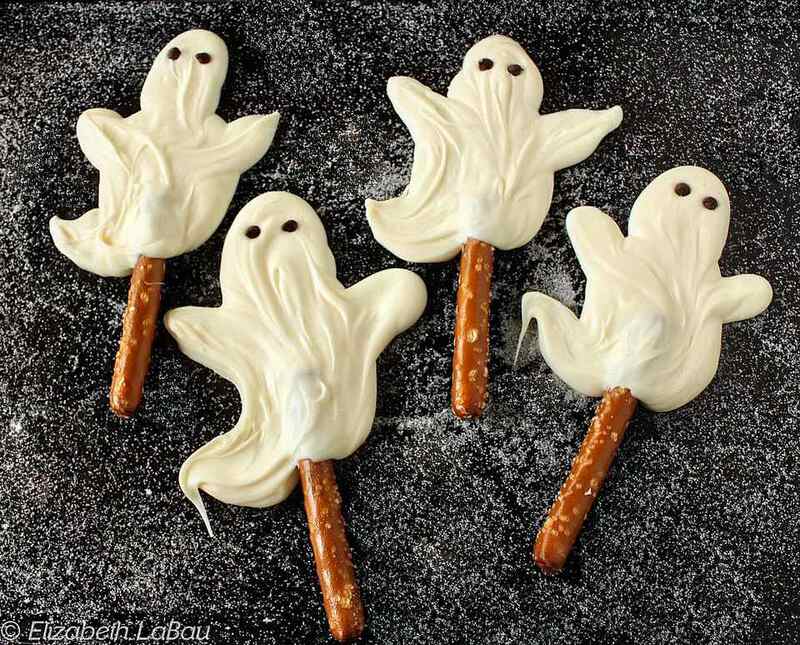 These delicious White Chocolate Ghosts are riding on crunchy pretzel broomsticks for an extra-spooky Halloween candy treat. If you can't find large pretzel rods, you can use lollipop sticks or wooden craft sticks as a non-edible alternative. Prepare a baking sheet by lining it with aluminum foil. Using a sharp knife, cut the pretzel rods in half and arrange them in well-spaced intervals on the baking sheet. Place the chocolate in a microwave-safe bowl, and microwave it until melted, stirring after every 30 seconds to avoid overheating. This recipe works best if the chocolate is very warm (but not burned!) so make sure that it is melted, smooth, and very liquid. If your chocolate still seems stiff, try stirring in a tablespoon of shortening and mixing until it melts. Using a spoon, drop a blob of chocolate over the top half of a pretzel rod, forming the body. Add a head and two arms, then swirl the spoon over the chocolate to bring all the pieces together and give the shape a unified look. These are meant to be free-form, so don't worry about getting them to be precise and identical. Alternately, you can place the white chocolate in a large zip-top bag and cut a small hole in the corner, then use the bag to pipe the ghost shape instead of using the spoon method. While the chocolate is still wet, press two miniature chocolate chips into the head for the eyes. Repeat with remaining chocolate and pretzels. Place the sheet of ghosts in the refrigerator to set the chocolate, about 30 minutes. Chocolate ghosts may be stored in an airtight container in the refrigerator for up to two weeks.